Should all students get a taste for entrepreneurship? Many students really do want to become entrepreneurs and start start-ups while they are still at university. Nationally, and at UTS, about 40% are actively planning to develop entrepreneurial capabilities. But, why and how? If turns out the ‘why’ might be easier to explain than the ‘how’. There are many reasons why. Headline grabbing stories of students launching million dollar start-ups are always good inspiration for others to follow a similar path. For some students, the term ‘entrepreneur’ is actually a turn-off. Yet, they recognise that entrepreneurial capabilities are extremely valuable if they anticipate becoming an independent professional, like a like designer, photographer, lawyer, accountant, etc. Another group of students are more interested in the prospect of being a highly sought after intrepreneur in a corporate environment, where that ability to take initiative makes you stand out over your peers. From this perspective, these are known as #futureofwork capabilities (see also WEF, 2016). More generally than these groups, Millennials are also known for wanting options, which could mean having a regular day job, but also hedging bets with a side-hustle, pet project or other part-time entrepreneurial initiative. Lastly, fear is a driver towards learning entrepreneurship. There is an increasing anxiety that future generations will have a life of jobs instead of a job for life. That uncertainty of future career paths is directly analogous to the uncertainty that entrepreneurs face as they figure out their customers, suppliers, business model, etc. How to develop entrepreneurial capabilities? Historically, the answer was to look outside uni for support. The temptation to skip or leave university is high when you can get an education in entrepreneurship AND get paid for it. Wait, what? Yes, that’s effectively what many accelerators do. They recruit novices into an intensive program, shower them with mentoring, facilitated peer-learning and some seed funding in hopes of creating the next Canva or Atlassian. It is unsurprising then to hear media outlets describe accelerators as “The biggest professional-training system you have never heard of” (The Economist, 2014) or the “new business school” for entrepreneurs (TechCrunch, 2015). Governments everywhere have been piling in to fund accelerators, in hopes of creating a virtuous cycle of longer-term economic development. In the broadest sense, as described in the new book on Accelerators, “accelerators are a rapidly growing new form of organization that aim to stimulate entrepreneurship.” While they are a new form of organisation, their ethos has been 30 years in the making in Australia. After a slow start and early bad timing, Australia gradually established a venture capital industry and started a support scheme for accelerators. For some, the government support for accelerators came too late and they could not build a business model around supporting early stage entrepreneurs. Pioneers like Pollenizer closed shortly after their 10th birthday. Other notable departures from the accelerator scene include JFDI in Singapore in 2016 and Wavefront in Canada in 2018. (v) (perhaps most importantly) mentoring. These five attributes soon after found their way into the $23M Incubator Support Programme announced during the IdeasBoom campaign. The Programme has since started handing out millions of dollars across emerging accelerators and incubators, including well-known organisations like StartMate, BlueChilli and Slingshot, Sydney Startup Hub member The Studio, and many more lesser known ones, particularly in sectors and regions that have typically not received much support from private sector accelerators. The challenge with accelerators is that they are a brutally expensive way to educate a relatively small cohort. Many of the cohort will fail right away. Their future attempts might finally grow into massive successes, but with an entirely new set of investors (if any). Nonetheless, there is hope that they stimulate a more vibrant economy and that the success of a few graduates justifies the losses of the rest. These high hopes are part of the reason that the accelerator industry is expanding at a remarkable rate. We have seen nearly 40% CAGR in the sector from 2007-2017, as shown in our latest graph of the industry. These counts are conservative, since we included multi-location accelerators only once. That means, Slingshot, Muru-D, BlueChilli, Incubate, and Founder Institute are only counted once, not once per location, vertical, program, or corporate partner. Notable in the graph above is that virtually every university runs one or two, or is affiliated with one. To many, accelerators may be the latest fad in a scramble to help students transition into self-employed career paths, as well as the most resource intensive one. Indeed, across many universities, there has been a surge in new programs to support developing entrepreneurial capabilities, including conferences, workshops, programs, MOOCs, hubs, competitions, etc. 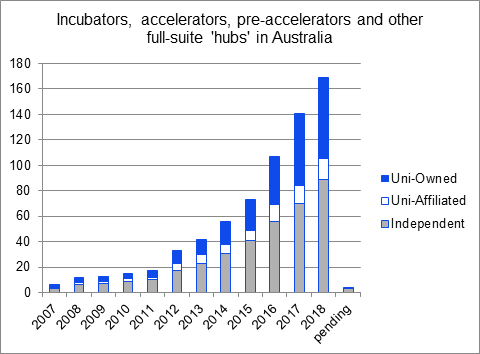 To illustrate this surge, can analyse activities at UNSW, where there was an explosion of activity coinciding with the 2012 launch of the Michael Crouch Innovation Centre (MCIC), as seen in the 2017 analysis of the StartRail maps we produced. This explosion is playing out across several universities (alt link). For example, at UTS, our internal review of innovation, entrepreneurship and design classes in 2017 identified over 80 different classes taken by more than 5,000 students. Over the entire duration of a student’s degree this means that approximately one-third of UTS students will have some formal innovation and entrepreneurship learning. Combined with the breadth of extra-curricular innovation and entrepreneurship activities available through UTS Startups, it is indeed a very exciting time. Especially for the 44% of current UTS undergraduate students who – in a recent survey – revealed that they are likely or very likely to join a start-up, or the 34% who responded that they are likely or very likely to start their own business. In addition to the many individual classes and electives, students are increasingly opting for complete degrees, including the MBAe in UTS Business School, and the Bachelor in Creative Intelligence and Innovation, Bachelor of Technology and Innovation, and Diploma in Innovation in the new Faculty of Transdisciplinary Innovation (aka FTDI; disclosure, I’m the Course Director for the Diploma, which also serves as a pathway into the BCII). Building on this trend, UTS Business School and FTDI are collaborating on a new Bachelor of Entrepreneurship (Honours), commencing 2019. The options are almost overwhelming, prompting the need for a visual directory of all 80+ offerings across all faculties. How much support is too much? Time for a little math to estimate whether there are too many accelerators or too many on-campus options to learn entrepreneurship. Let us start with an estimate of how many startups are supported by accelerators annually. Assuming each accelerator supports eight start-up teams per year, with three founders per start-up that would mean over 4,000 founders. This is roughly equivalent to the entire population of start-ups and founders according to the Startup Muster surveys. While some debate remains about their population estimate, this 4,000 figure does raise the question: Are there already too many accelerators (and not enough entrepreneurs)? So what about the volume of support for the broader range of students interested in being entrepreneurial, but not interested in entrepreneurship? Circling back to the analogy between accelerators and university education for entrepreneurship, we can take a much broader view of how many students would benefit from participating in an accelerators or other experiential learning opportunity, even if they think they are not ready yet. For the purposes of estimating how much more need there is for entrepreneurship education programs, including accelerators and pre-accelerators, let us limit our focus on students and universities. Universities Australia (2017) reports approximately four programs per university, featuring only selective offerings per university. 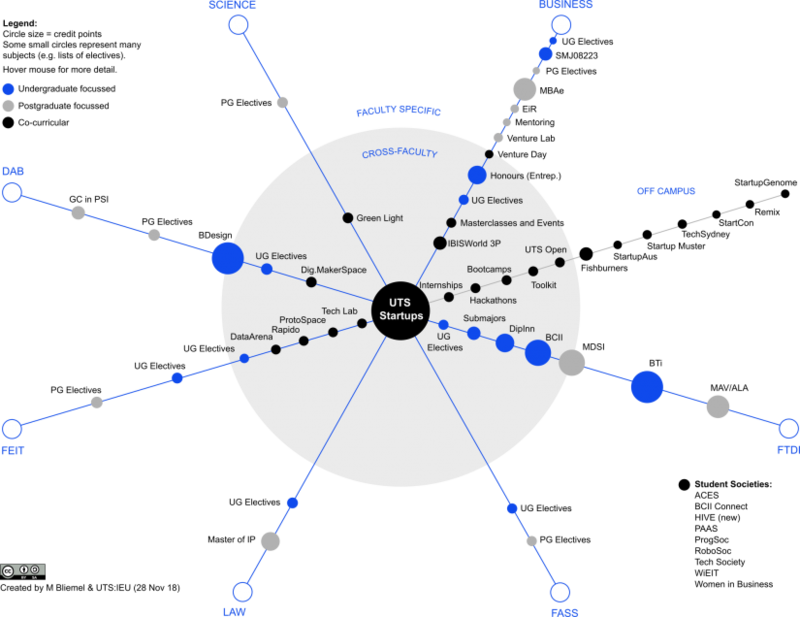 Meanwhile, the UNSW StartRails depict 22 separate programs, and our internal audit at UTS reveals quite a few more. If we use the systematic review of entrepreneurship education by Maritz at el. (2015) as a more accurate representation across all Australian universities, one of their findings says “Australian universities offer 307 subjects about entrepreneurship and 277 subjects related to entrepreneurship.” So, about 15 programs per university. Multiplying this 15 by an estimated 50 students per program, we get close to 30,000 students. Sure, this is much more than the number of start-up founders reported in Startup Muster, but this is a (2.2%) tiny drop in the bucket in comparison to the 1,300,000 students enrolled at our 40 universities. Clearly, there is more room to grow entrepreneurship education programs, possibly also in primary and secondary education for a smoother transition into an uncertain future. Post-script: Thanks for reading. If you’re a UTS student and interested in learning more about the Diploma in Innovation, please join our Information Session on 3 Apr. This post was originally published on Linkedin and is republished here with permission.